OG Bubble Gum by Zambeza is one of those strains that delight in various ways. Grow her for her very respectable yields and then, of course, after harvest enjoy her superb taste and great high. For growers, the amazingly short flowering time of only 55 days and then her yields of up to 600g/m² indoors and harvests of 650g per plant in ideal outdoor conditions can make growing OG Bubble Gum extremely rewarding. With a size of 100-130cm indoors she makes a perfect figure and stays very manageable. Outdoors, make sure she gets plenty of sun and she can get as tall as 200cm. Yet, good yields and just the right size to grow in almost any location are not everything when it comes to truly excellent cannabis. Make no mistake, OG Bubble Gum won’t disappoint there either and fully delivers with her great taste and aroma. Thanks to her Bubble Gum genetics, she tickles the palate with a superbly fruity mix of berries with just a slight hint of tangy sour flavours that she got from her OG Kush side. There is also some subtle oriental spice notes sprinkled in which makes smoking her an extraordinary experience that is simply irresistible. Her excellent indica genetics and the fact that she measures a good 19% of THC make for a very potent, super-relaxing stone that comes with a pleasant feeling of happiness. This is a superb strain not only for recreational users who want to enjoy something extraordinary but due to her potency also has good medicinal potential where she can help with the relief of chronic pains, muscle aches, sleeping disorders and many other ailments. OG Bubble Gum by Zambeza combines two already excellent strains into a new creation that can fully satisfy no matter how you look on her. This very productive indica is a delight to grow and the result is extremely rewarding, made even better given her super-short flowering time. 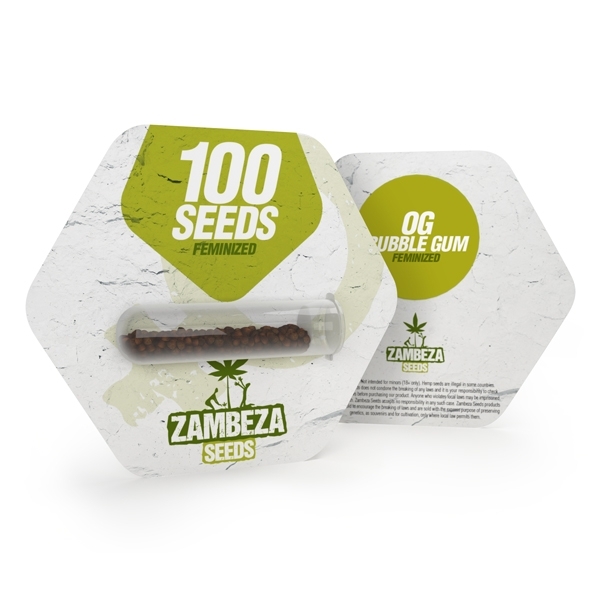 At Zambeza Seeds you can get larger quantities of OG Bubble Gum bulk seeds in economic packs of 100 seeds.